Book Review: Half the Sky - Book.Blog.Bake. 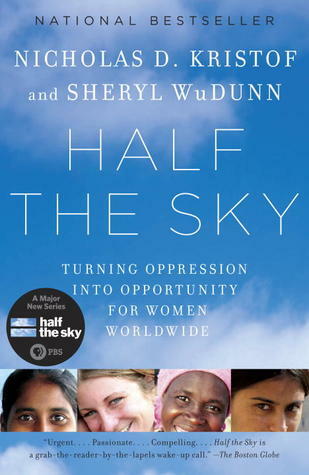 At the beginning of the year, I wrote about how I was planning to participate in the Social Justice Theme Read, and I planned all along to read Half the Sky. I’ve heard a lot about this book from friends, all whom told me to read this book as soon as possible. I’ve been reading mostly fiction lately, so it was a bit difficult for me to get back in the right frame of mind to read nonfiction, even though it’s one of my favorite genres. A journalistic work like Half the Sky is structured so differently than fiction books that it took me awhile to adjust, and for the first forty pages or so I was experiencing some pretty heavy dissonance. I was interested in the subject but having trouble concentrating on what points the authors were actually making, especially since they just dived right in to the subject matter. Soon, though, I was able to really understand what I was reading and my heart was broken. This was a really necessary read for me, I think, to learn about what struggles women face across the globe. Some of the anecdotes that were shared crushed me to really think of what was happening to women across the world. Even though I’ve heard all the statistics, to hear actual stories and sometimes even see pictures of women who have endured horrible abuse really hit home. This is a book everyone should read in order to gain a better understanding of the world. In most places, it’s an extremely balanced look at global issues and when the author’s biases come through, disclaimers are quickly made. It’s a very accessible book that sheds light on issues I didn’t even know were issues, but now that I do, I can’t ignore them. In short, I’m really glad I decided to read these book, and I think it’s a book that would leave most people feeling the same way. Final Impression: I would have liked a better frame of reference at the beginning of the book, but once I got about twenty percent in I was able to really get into the issues and stories that were being talked about. This book did a great job of sharing stories instead of just statistics and I think it would make an impact on most people. 4/5 stars. The February 2013 Social Justice Theme Read is being held by Resistance is Futile. Hi! It looks like I missed this post for the Social Justice Theme Read. I was awfully distracted by unexpected events in February, so I got a bit behind. Sorry! The Sunday Wrap-Up(1) | Book.Blog.Bake.